Artists’ talk event with all the exhibiting artists: March 9th at 5:30 p.m.
Mokuhanga is becoming a common word in the world of printmaking. Here we will introduce some of the European artists who exercise this technique in their countries. Through their works we would like to learn how and why they were attracted to Mokuhanga. With technical and thematic comparisons between their works before and after Mokuhanga acquisition, we will also learn how they understand, interpret and merge the distinctions between the two cultures. Especially important are the European points of view because they have a long cultural history, and so they are an intercultural model. We will also discover each particular way printing and carving tools are used in both cultures, which allows each artisan (and so eventually each artist) a different way of working and performing their ability. Different from the western artistic tools which are meant to be used for a specific purpose, Japanese chisels and cutting knives change their use accordingly to the artist or artisan who is handling them. The exhibition will also talk about other features of this art which continuously attract foreign artists, which are environmentally friendly materials, practicality even in smaller spaces, as well as the portability of working tools. In the exhibition, Laura Boswell, Mara Cozzolino and Paul Furneaux will show their latest works and some of their retrospective works. Please become witness of their works where they show each unique subject and genre with developed technique from the Mokuhanga. ■ Mara Cozzolino will be present with one of her pieces in another venue: Inside the Main Gallery exhibition of 3331 Art Fair (Admission ticket is required). For opening hours and ticket information, please visit the special website of the fair. Mara is an Italian printmaking artist who lives and works in Turin, Italy and is also expanding her exhibition and workshops in various places in the world. She is one of the earliest participants in our Artist-In-Residence Program “MI-LAB”, and nowadays she uses Mokuhanga technique which she acquired there. Introducing Mokuhanga has changed totally her style of art. Many of her recent works show night view with clear silhouette of trees, where it seems that she researches darkness, just like contrary to what watercolor and Washi effects of Mokuhanga offers, the softness and gentle lights. Motifs of her works show rather sensibility close to that of western arts, as well as composition and color choices. Extracting them by using Japanese traditional arts, we can see in her prints universal theme that is fusion and/or comparison between two different cultures. CfSHE Gallery is pleased to show the prints created during our last residency program of the year 2018 “Advanced Program E”. We had a few new participants who learned about the MI-LAB after the “International Mokuhanga Conference Hawaii 2017”. Some of them had different points of view regarding technique, and they gave the MI-LAB the opportunity to know new techniques of Mokuhanga. Furthermore, this was the last Residency program taught by Master Printer Tetsuo Soyama, who had played an active part in the MI-LAB residence and CfSHE workshops and summer camps. He passed away the 9th of January. The exhibition will be dedicated to the Master. For more info, please write from the contact form. Opening reception:　December 15th at 6 p.m.
We are pleased to open the solo exhibition by Chihiro Taki, young Mokuhanga artist present in contemporary print arts scene. Her works are inspired from moments and places the artist encounters and wants to remember, which are developed by the artist up to the images evok a poetry in between illusion and reality. They are expressed with goma-zuri, one of Japanese Mokuhanga technique executed by using much watery diluted paints, and kira-zuri, used for decorative expression in the same Mokuhanga. The result of these techniques developed by the artist herself on washi shows their brilliant fusion of texture and brightness. Her works have been introduced in both national and international art scenes. She has continued to join international shows and fairs scince when he was studying at master’s program at the Musashino Art University. Furthermore, she dedicates to diffusion of Japanese Mokuhanga, teaching at workshops in various places. 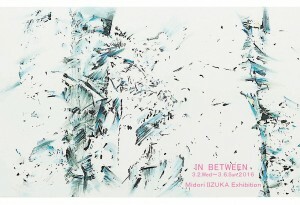 This is a unique chance to see her series of works in a single exhibition; the half of exhibited works are brand new works. Please come and find them at our gallery. Click here to read press release and the Artist’s information. Some of small works from our Mokuhanga artists will be exhibited at CfSHE Gallery stand inside the Arts Chiyoda this weekend. Find here art gifts for upcoming vacation! CfSHE Gallery is pleased to show printing works created during two Basic Training Program of this year’s Artist-In-Residence MI-LAB Program. The Basic – B program have taken place in the hottest period of the year, even if the view of Mt Fuji has been also the best throughout all the program. Various types of images are born there: abstract images inspired from motifs found around the place, imaginary world, and themes expressed more concretely such as swimming scene from which we feel the summer. While the Basic – C program has met so many typhoons during the residency, that we felt so lucky and happy to see the rare view of Mt. Fuji. It was a long journey under the severe weather. Some of artists have actually expressed themes related to the nature, including Lake Kawaguchi-ko. Please find the unique expressions by Mokuhanga artist from overseas. CfSHE Gallery presents printing works created and donated to MI-LAB during “Advanced Program D”, one of the Artist-In-Residence held in summer season among the total five residence programs of this year. The participated artists struggled in Mokuhanga for five weeks with fighting, but with affection toward, rainy season arrived quite early this year, and managing to complete their own work with creative themes even in busy schedules of the program included both Japanese bookbinding program and tool maintenance technique. CfSHE Gallery is pleased to show the prints created during this year’s our first residency program “Basic Training Program A”, together with selected work from MI-LAB archives. In Nagatsuki, the old name of September which means long rice plants, they celebrate harvest of rice. We celebrate this month with a part of our collection rich of variety which demonstrate possibilities of Mokuhanga technique in two (and some transitory between) confronting concepts: from monotone to multi color & from figurative to abstract. You will also find curious research in paper making with visualizing fibers of Kozo as a figurative image. Opening hours:　13:00 – 19:00 on Sat. and Sun. 13:00 – 17:00 from Mon. to Fri. In Mokuhanga, what is carved will become white. Mel Cheong, who had participated to Artist-In-Residence at Lake Kawaguchi – on the foot of Mt. Fuji -, returned this year to encounter the mountain in a white dress in March. In that view, she waited to open a new page in the story about Mokuhanga, about the nature, about the people there and about her. Here the new page is. “I still remember the days when I look at Mt. Fuji in the morning, I can feel the soft breeze in the air, I look upon the field in front of me, the sky is as clear as a crystal. It is something I can never image in Macau. There was also a day when we were very excited waiting for the sunset together, Keiko San told us that the lights from the climbers will form a necklace on Mt. Fuji. All these details, all these feeling, combines and become a late summer story of Mt. Fuji. We are pleased to announce the opening of Takuji Hamanaka solo exhibition “Spiral Passage”, an event synchronized with Arts-Chiyoda-3331 Art Fair. Takuji Hamanaka is a Japanese artist who practices Japanese traditional water-based woodblock printmaking (Mokuhanga) based on between New York, US and Japan. Hamanaka had been working with numerous contemporary projects as professional printer, after he had achieved the traditional technique in Japan. He also practices in his own artistic work, representing contemporary images by using traditional technique. In recent years he has been investigating characteristic effects and materials found in printmaking and use them in unfamiliar context or use them in excessive manner. One of the project is to focus on typical printing application called “ Bokashi” that is a variation in lightness and darkness of a single/multiple colors by hand applying a gradation of ink to moistened woodblock. This characteristic printing approach is often found in prints by masters such as Hiroshige and other Ukiyo-e artists. Using these prints in different colors as a starting point, He constructs image by cutting them in various shapes as if one makes mosaic window using sheets of hand blown colored glass. Though obviously quite different materials, there are striking similarities between the way woodcut and stained glass is constructed conceptually. 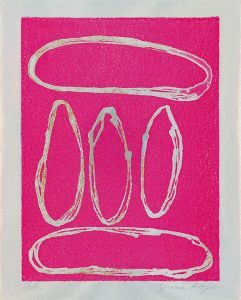 He sees expanding possibility of traditional printmaking by displacing the characteristic idea/effect to attain unique consequence. In the works showed in this exhibition he tries to make “repetition” which appears also in the natural phenomenon, reflecting it on his artistic action such as repetitive printings, copied images by them, and numerous combinations of collages made of them. However he believes that none of the repetition is similar to the others and that it creates a form like a spiral, which offers us an occasion to recognize locus of the working procedures and of the phenomenon. This exhibition will be held under the theme “Contemporary Mokuhanga” a concept which has been developing over the world beyond the Japanese traditional technique. The CfSHE Gallery introduces the solo-show of Hamanaka who supports this movement as instructor and also works as artist inside. Also in this event you can see Hamanaka’s works with other painting/sculpture/craft works by over 60 Japanese/international artists recommended by renown curators. Hours:	7 March:　　6.00/8.00 p.m.
From 8 to 10 Mach:　　12.00/8.00 p.m.
We will open the exhibit of collected small works selected from MI-LAB archives related to the month of February. In the ancient Japanese calendar February was called Kisaragi which literally means the cold month when we wear warm clothes. Despite of the cold, spring and its fresh and vivid colors are just behind the corner. Mokuhanga works starting from the one titled Kisaragi that gives name to the exhibition, have the lately winter and the early spring colors imprinted in them. In these cold days we hope that the Mokuhanga’s colors could warm your sight. Happy new year for all Mokuhanga friends and supporters! This year 5 Residence programs are coming – much more artists will come and stay at MI-LAB residence at Lake Kawaguchi. In the meantime, MI-LAB presents this year’first event at CfSHE Gallery that is exhibition of print works created during 2017 Advanced Programs by 11 artists which have been donated to MI-LAB. Admission Free / Open throughout the exhibition period. This year 4 Mokuhanga Residence Programs have been held at MI-LAB of Lake Kawaguchi; 2 Basic Training Programs and 2 Advanced Programs where total 23 artists from 10 countries have participated. In this exhibition we introduce the print works created during the Program by 12 artists participated to Basic Training Programs which have been donated to MI-LAB. Exhibition of Advanced Program participants will follow in January 2018. The Center for the Science of Human Endeavor (CfSHE) is pleased to present the exhibition Searching for Mokuhanga Light: Globalizing Japanese Woodblock, which demonstrates the organization’s twenty year project to facilitate the globalization of mokuhanga – Japanese water-based woodblock printing technique used for ukiyo-e prints. 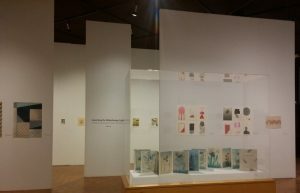 The exhibition showcases the selection of prints that were created and donated by the alumni of the two artist-in-residence programs: the Nagasawa Art Park (NAP) Artist-in-Residence, begun in 1997, and its successor the Mokuhanga Innovation Laboratory (MI-LAB), begun in 2011. It follows the path of Keiko Kadota, the late director and co-founder of the two programs. She encouraged the contemporary adaptation of mokuhanga by bridging international artists with mokuhanga and its context – Japanese culture, history and traditional craft. 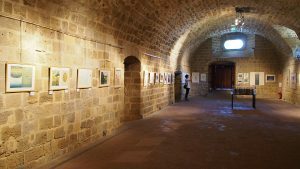 This exhibition was first held in Cyprus as European Cultural Capital in June 2017, and then travelled to Hawaii, as a special exhibition of Third International Mokuhanga Conference September 28 to October 1, 2017. Mokuhanga has a distinctive quality of light and historical richness, which increasingly attracts printmakers and artists to visit Japan to learn its techniques. Together NAP and MI-LAB enabled more than 200 artists to study mokuhanga in Japan and alumni from the US, South America, Europe, Asia and Oceania have become leading researchers, educators and artists of mokuhanga in their own countries. Many of them were fascinated by mokuhanga’s low environmental impact using hand hold tools and materials, but also by its infinite possibility and challenges; for instance, the printing result is dictated by many conditions such as the paper’s thickness and dampness; and the ingredients including nori (rice paste), pigments, humidity, weather, type of baren (hand-held printing disk), and the pressure of hand printing. Mokuhanga’s watery quality and intimacy are emphasized by the use of washi – paper made of plant fibers that have been traditionally used in Japan – which also intrigues artists. Many alumni continued mokuhanga and even became key presenters at the International Mokuhanga Conferences. This exhibition intends to acknowledge the alumni’s effort and Keiko Kadota’s commitment to promoting mokuhanga and revitalizing related craft industries that employ blacksmiths, brush makers, pigment makers and especially papermakers. Kadota’s work also culminated as the International Mokuhanga Conference which she co-founded as a platform for networking and the academic exchange of information about mokuhanga. The conference marked the 6-year anniversary at the Honolulu meeting. The exhibition also acknowledges the support of the Japanese government that implemented the Artist-in-Residence program in 1997 – when NAP was launched – this financial support was essential to continue the programs. The global activities of NAP and MI-LAB alumni attract the attention of Japan, the country in which ukiyo-e was created but where the potential for creative use of this medium by contemporary artists might be overlooked. Finally, this exhibition is a statement by CfSHE of their willingness to inherit Kadota’s spirit and continue MI-LAB programs. CfSHE Gallery is pleased to present the recent works of Yumi Kojo from July 13rd 2017 to July 17th 2017. Yumi　Kojo is an artist who use printmaking’s technique on the texture of fabric. CfSHE Gallery is pleased to present Swayed Shadows | Kazuki SAKAI + Chihiro TAKI showcasing the works of two young emerging artists in conjunction with 3331 Art Fair to be held in the same building. 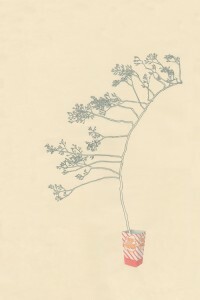 Using mokuhanga (water-based woodblock printmaking technique) as a main medium, Sakai and Taki will create the installation of mokuhanga prints which arouse the sensation of delicate tactility. Shadows in question are reminiscent of Plato’s Allegory of Cave in general, but in the looking of art, it is concerned with an image that artists observe in their subject, illusion transferred onto the canvas, or impression given to the viewers. These shadows will be present by means of mokuhanga’s material and technique, which will resonate and sway in the installation. Sakai relates mokuhanga to filmmaking. He uses the image of his friends and found photos as a starting point of his creation. He soaks printing paper extensively and print the layers of ink for a number of times. This process generates fragile and fuzzy feature of his work inspiring the passage of time and things. Unlike Sakai’s depiction of people, Taki’s work results from the encounter with Nature and a space. The dialogue with these things – the experience of purely communicating with a subject in question – is processed and translated into color, shape and bleeds. While representing ‘shadows’, her work demonstrates the presence and the physicality of its origin to the same or even more extent. Taki’s work also reveals the delicate quality of color and texture resulting from washi and repetitive printing – like Sakai’s approach. These elements evident in Sakai’s and Taki’s work – delicate physicality, tension and the depth of spatiality – are commonly inherent to mokuhanga. This exhibition will be held under the title of Contemporary Mokuhanga. Water-based woodblock printmaking currently called as ‘Mokuhanga’ has developed its definition way beyond the traditional mokuhanga or sosaku-hanga. Both Taki’s and Sakai’s works were highly remarked as ‘Japanese Contemporary Mokuhanga’ in Fragile Story (2016) that traveled to Australia and the US. Swayed Shadows aims to present the contemporary adaptation of mokuhnaga in Japan. It will invite viewers to enjoy the dialogue with various ‘shadows’ and with the new potential of mokuhanga. Born in Tokyo in 1988, Sakai completed the master’s course in Fine Arts at Tokyo University of the Arts in 2015. Using film and printmaking as a main medium, he creates installations that capture uncertain situations. In 2016, he participated in MI-LAB’s exhibition, Fragile Story – the exhibition that featured young mokuhanga artists that traveled abroad. Born in Shizuoka, Taki graduated from the master’s program (printmaking) at the Musashino Art University. 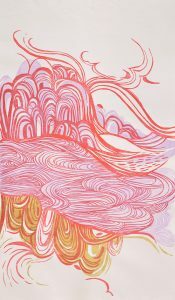 Taki is a Tokyo based artist producing and showing works of water-based woodcut prints. She participated in MI-LAB’s exhibition, Fragile Story – the exhibition that featured young mokuhanga artists that traveled abroad. CFSHE Gallery is pleased to present a solo exhibition of prints by Japan based Korean artist Mia O from October 14, 2016 to October 23, 2016. Her exhibition features landscapes in Japan. The topic of the relationship between nature and humans has always been her interest and fascination. Her art work is deeply influenced by her lived and felt experiences in Japanese culture and landscapes. In the Mokuhanga she finds the wisdom of how Japanese people integrated nature into its art medium/form. Mia O was born in Korea. She finished her Bachelor of Arts degree at Hong-ik University, Seoul, Korea, in 1996 and completed her MFA at Pratt Institute, NY, USA, in 2000. Mia O participated in the Nagasawa Art Park, Artist-in-Residence program in 2003. She is currently based in Tokyo and works and conducts workshop at CFSHE Gallery. Her works have been shown internationally in UAE, US, Europe, Korea and Japan. To participate in the artist talk of this event, please e-mail to us. CfSHE Gallery is pleased to present a solo exhibition of prints by Yoonmi Nam; A Korean artist and printmaker based in US. The exhibition features her recent works depicting of images of man-made environments and objects, and cut flower arrangements as metaphors to evoke a sense of time that is both fleeting and eternal. The exhibition runs from July 2nd.2016 to July 15th, 2016. Yoonmi Nam received a BFA degree from Hong-Ik University in Korea and an MFA degree from the Rhode Island School of Design in US. She participated in Nagasawa Art Park Artist-in-Residence program in 2004 and Mi-Lab Advanced program in 2012. Her work has been shown both nationally and internationally and she teaches printmaking and drawing at the University of Kansas, where she has been a faculty member since 2001.